Four stars of tomorrow perform in Florentine Opera’s ‘Romance Español’. Ariana Douglas, Leroy Y. Davis, Ashley Puenner and Thomas Leighton. Since 2008, the Florentine Opera has run a kind of second season, a Studio Artist Program which bring some of this country’s top, young talent to Milwaukee, where they stay in residence for a year or two, and perform in smaller, more intimate studio productions. This weekend features a concert called Romance Español, with a Valentine’s Day theme and a fun mix of Spanish and English language music, from opera, broadway and other sources. 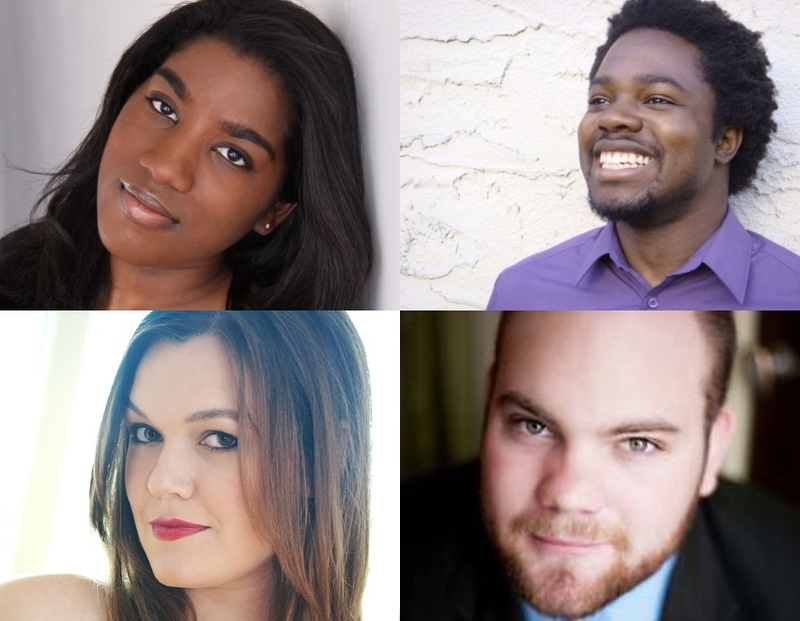 Three of the studio artists, soprano Ariana Douglas, baritone Leroy Y. Davis and tenor Thomas Leighton, are in their second year as studio artists. Douglas is from Appleton with a strong Wisconsin background, as we’ve written, while Davis is a New York City native with an equally interesting back story. They are joined in this concert by Leighton (a native of Saugerties, NY) and a new studio artist for this year, mezzo-soprano Ashley Puenner, from Crystal Lake, Illinois. All four could be big names of tomorrow in opera and in fact are already rising up in that world. Douglas was one of the four winners of the Wisconsin District Metropolitan Opera National Council Auditions in 2016, covered the roles of Mary Warren and Ann Putnam in The Crucible at the Glimmerglass Festival that year and has an upcoming engagement to play Zerlina in Don Giovanni. Davis played the role of Don Alfonso in Cosi fan tutte with the New England Conservatory and the role of Ping in Turandot with the Shreveport Opera. The studio artists live in a nice, renovated home in Riverwest just down the way from the Florentine’s office and studio and have all performed in smaller roles in main stage Florentine shows, while getting acquainted with all the Milwaukee scene has to offer. “Many people don’t associate opera with Wisconsin,” Douglas once told Urban Milwaukee, but the state has been crucial for her development, including her experience with the Florentine. The smaller ensemble shows like this one are where Douglas and her three colleagues really get a chance to shine. The program is chosen to show off their vocal skills but also to charm and thrill audiences. Selections includes arias by Bizet, Mozart, Beethoven and Rossini, Broadway songs from Man of the La Mancha and Sondheim’s Company, and a range of Spanish language songs, from the well-known “Bésame Mucho” and “Granada,” to classic romantic and tragic works by revered Spanish and Latin American composers. And the accompaniment is by a distinctive instrumental ensemble featuring piano, violin, guitar and double bass. For a sample of the Florentine’s studio artists, they recently appeared at the National Opera Center in New York City with selections from the Florentine Opera recording anthology, which you can listen to on YouTube. As we said, these are rising stars. Performances on Friday, February 10, 7:30 p.m.; Saturday, February 11, 7:30 p.m.; and Sunday, February 12, 2:30 p.m. Wilson Theater at Vogel Hall in Marcus Center for the Performing Arts. Tickets can be purchased online or call 414-292-5700 ext. 224.